The music of Frankie Valli and the Four Seasons is timeless and has transcended the era in which it was released. “Lights Out” – The Nation’s #1 Tribute to Frankie Valli and the Four Seasons, announces a rare northern New Jersey appearance in Livingston, NJ. The group, which has headlined major venues in Las Vegas and Atlantic City, has continued to make their mark around the country. Performing all of Valli’s hits including, “Sherry”, “Big Girls Don’t Cry”, “Who Loves You”, “December 1963 (Oh What a Night)” and so many more, the group’s spot on vocals, high-energy choreography, and comedic interludes keep audiences, singing, dancing, and laughing throughout the show. “Lights Out” is excited to bring their show to Heritage Middle School in Livingston, NJ and looks forward to creating an unforgettable concert experience for fans in northern New Jersey. 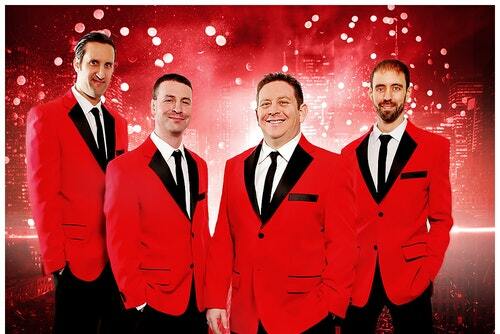 Lights OutA Tribute to Frankie Valli and More!